The JBM Group, under the name of Jay Bharat Maruti Ltd., entered into a joint venture with Maruti Suzuki and a largest venture emerged in 1987. 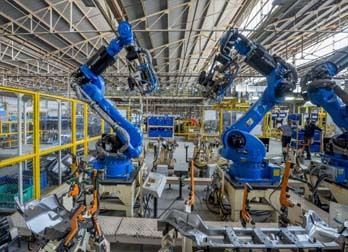 The joint venture since then is engaged in world class manufacturing through indigenous press lines, robotic welding besides plating and painting facilities. The venture keeping pace with time and technology extended its capacities in 1991 and then in 1993. In the year 1995, a new plant was setup, which further developed and extended in 1996, 2001 and 2002. As the name suggests, SMED is the process involving steps towards changing of the die(of any given profile) after a requisite amount of batches are produced during a work scheduled. In order to obtain an “economic order quantity” during a manufacturing scheduled it becomes important that our allowance time such as die exchange should be reduced in order to restart our manufacturing work in minimum time which is both practical(in terms of labour force time required to change the die) and economical feasability also.Therefore,the thrust remains upon ensuring steps to reduce die exchange time. To understand how SMED can help we have to look at the changeover process. Typically when the last product of a run has been made the equipment is shut down and locked out, the line is cleaned, tooling is removed or adjusted, new tooling may be installed to accommodate the next scheduled product. Adjustments are made, critical values are met (die temperature, accumulators filled, hoppers loaded, etc.) and eventually the startup process begins – running product while performing a time, time that can be reduced through SMED.